In 1958, Hambro the major US dealer for Austin Healey enetred a team of three 100-Sixs at Sebring. The cars were entered as 100-Six "MM"'s and went on to win the Manufacturers team prize. One of the drivers was Bill Kincheloe who confirmed the 100-Six "MM" designation to Ron Yates . The actual Sebring car is shown in Race Pics. 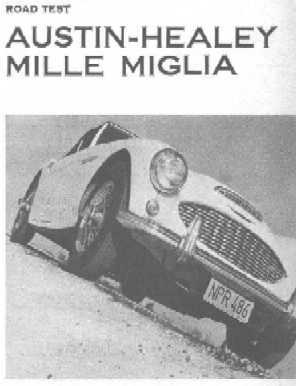 In addition to the DMHC price list and the road tests it is also clear that Austin Healey dealers in the US were aware of the Mille Miglia connotation. I know someone in the USA who purchased a new 100-Six and says the dealer distinctly referred to "the new Mille Miglia engine". He adds that it was common for enthusiasts at the time to refer to the "MM" model. .
Gary Anderson, Chairman of AH Concours Registry speculates on the reason for the missing factory literature. "Perhaps it is because the model came out mid-year. By the time the fall of 1958 rolled round with the annual update of sales literature for the new model year, BMC would have been pretty far along in its planning for the car to be produced starting April of 1959, with an increased capacity engine and front disc brakes that would become the 3,000 on introduction and decided it wasn't worth producing a brochure for a car that was about to become obsolete. So I speculate that while the Mille Miglia did exist as an official BMC model of the Austin-Healey for a brief period of time, it was eclipsed by the 3,000 and thus was never perpetuated in sales literature." When DMH added a Le Mans kit to the 100 it became the 100M. I suggest that if DMH was refering to the "MM" kit then we should apply the same logic and call the cars the 106-Six "MM"
Road & Track obviously believed there was a 100-Six Mille Miglia or "MM" model. This is from their April 1958 issue. An earlier mention of the 100-Six "MM" was in the Dec 1957 edition of Sports Cars Illustrated whilst Motor Trend also refer to it their August 1958 Issue. 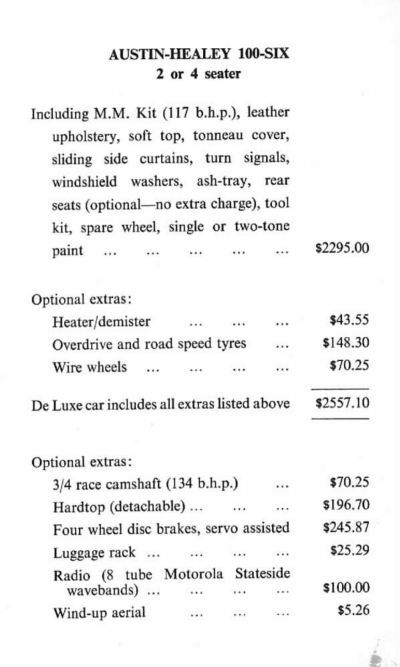 The most conclusive evidence of the car's "existence" is the Donald Healey Motor Company price list for the 100-Six produced for distribution to US Armed Forces personnel in England. One copy of this exteremely rare document belongs to Jim Werner of the Blue Grass AHC in Kentucky. The list clearly desribes the car as "including. M.M. kit, (117 bhp)". As of now this appears to be the only piece of MM literature from either dealers or the factory. Jim seems to be the only person who has one. Visit Jim's "Healey Adventure" Web Site which is full of other interesting information).